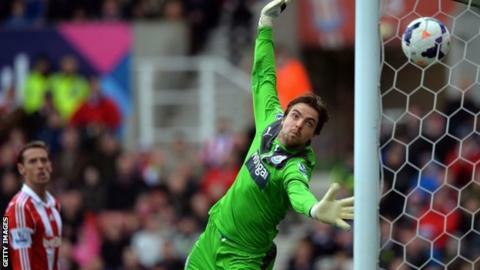 Erik Pieters's fluke goal earned Stoke their fourth win in five league games at the expense of a lacklustre Newcastle. The Dutch defender scored for the first time in the Premier League when his intended cross from the left drifted over the head of Tim Krul and found the goalkeeper's top left-hand corner. Stoke also went close through Peter Crouch, whose shot came off a post. Newcastle's Vurnon Anita headed over from three yards late in the game. But a draw would have been unfair on the home side, who showed plenty of intent and conviction throughout, while the Magpies only threatened in the last five minutes. Stoke's latest win at the Britannia Stadium - their fourth in succession - means they are now only three points behind the ninth-placed Magpies. It was a different story when the teams met on Boxing Day, Newcastle's 5-1 victory against the nine-man Potters putting them sixth in the table and 12 points clear of their vanquished opponents. But having since secured their Premier League future and seemingly fulfilled owner Mike Ashley's directive of finishing in the top 10, Newcastle have stalled. Stoke are also safe, but manager Mark Hughes is not allowing his men to relax. And they should have won this game by more than one goal; striker Crouch hit an upright from four yards, headed over from similar range and then had a diving header clasped easily by Krul. Midfielder Steven N'Zonzi also went close when his goalbound shot was deflected over the bar by centre-back Fabricio Coloccini. The Potters did, however, find a way through three minutes before the break, thanks to a large slice of fortune. Pieters, who along with Marko Arnautovic caused Newcastle problems on the left, looked to find Crouch with a deep cross but instead saw his wind-assisted delivery float into the far corner. Newcastle's best chance came in the final 10 minutes when Dutch midfielder Anita headed Shola Ameobi's cross over at the far post. Match ends, Stoke City 1, Newcastle United 0. Second Half ends, Stoke City 1, Newcastle United 0. Attempt missed. Marko Arnautovic (Stoke City) right footed shot from outside the box misses to the right. Assisted by Charlie Adam. Foul by Mapou Yanga-Mbiwa (Newcastle United). Peter Crouch (Stoke City) wins a free kick on the left wing. Attempt missed. Mapou Yanga-Mbiwa (Newcastle United) right footed shot from outside the box misses to the right. Corner, Newcastle United. Conceded by Glenn Whelan. Attempt blocked. Michael Williamson (Newcastle United) left footed shot from the left side of the box is blocked. Assisted by Shola Ameobi. Attempt blocked. Yoan Gouffran (Newcastle United) right footed shot from outside the box is blocked. Assisted by Mapou Yanga-Mbiwa with a headed pass. Erik Pieters (Stoke City) is shown the yellow card for a bad foul. Adam Armstrong (Newcastle United) wins a free kick on the right wing. Attempt missed. Shola Ameobi (Newcastle United) header from the right side of the six yard box is high and wide to the right. Assisted by Cheick Tioté. Attempt missed. Vurnon Anita (Newcastle United) header from the right side of the six yard box is just a bit too high. Assisted by Shola Ameobi with a cross. Delay in match Marko Arnautovic (Stoke City) because of an injury. Corner, Stoke City. Conceded by Mapou Yanga-Mbiwa. Delay in match Hatem Ben Arfa (Newcastle United) because of an injury. Attempt missed. Charlie Adam (Stoke City) left footed shot from outside the box is high and wide to the right from a direct free kick. Fabricio Coloccini (Newcastle United) is shown the yellow card for a bad foul. Attempt missed. Charlie Adam (Stoke City) left footed shot from the left side of the box is close, but misses to the right. Assisted by Marko Arnautovic following a fast break. Substitution, Newcastle United. Adam Armstrong replaces Papiss Demba Cissé. Substitution, Newcastle United. Hatem Ben Arfa replaces Dan Gosling. Corner, Newcastle United. Conceded by Peter Odemwingie. Attempt blocked. Yoan Gouffran (Newcastle United) right footed shot from outside the box is blocked. Assisted by Papiss Demba Cissé. Foul by Peter Odemwingie (Stoke City).